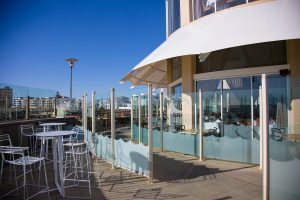 Sammy’s on the Marina is one of the iconic Seafood restaurants of Adelaide. Situated in the popular tourist destination of Glenelg, Sammy’s on the Marina is beautifully positioned in a peaceful corner of the Holdfast Promenade. It is very well known for its spectacular view of the sunset. The first floor offers a 270 degree view of the beach as well as Holdfast Marina. The first floor area is the main function area of Sammy’s and has created a lot of sweet memories for our guests to cherish over the years. The restaurant is very well known for its locally sourced, high quality seafood. The restaurant offers some of the freshest lobsters in town. These lobsters are freshly caught and bought alive from Kangaroo Island. 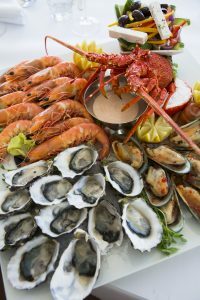 The menu boasts of a wide variety of other preparations like Lobster Thermidor, Bucket of Prawns, Oyster Mornay & Grilled King George Whiting (perhaps the only fish in the world that is named after a King) which is endemic to Southern Australia and the most popular of all. The seafood is locally sourced and we take pride in supporting the local fishing community. In addition to this wonderful array of meals, we have an additional menu feature – Platters. These platters cater to 2 (or on extra charge -3) diners and we serve a wide variety of fresh seafood platters. Our Deluxe Lobster Platter boasts lobster, along with 10 other seafood items and is the star of our menu, while the Meat Platter is a delight to all those who love their meats. Our restaurant menu features unique wine pairing suggestions for all the food menu items. Most of the wines served are sourced from South Australia – we regard that the highest quality wines of the world come from South Australia and our wine list is an ode to the wine regions of the state. The restaurant is hugely popular for being a host to a group of dolphins which is the restaurant’s major star attraction as well. Diners love watching the dolphins playing around in the serene sea while they lap up our delectable food and wine combinations. In addition, Sammy’s on the Marina is a long established brand in the market, in business for the past 30 years and attracts a host of dining patrons from the local community who have really strong memories of amazing dining experiences. The local patrons have a strong, emotional bond with the place and they make it a point to book with Sammy’s for some of the most important days in their lives (Marriages, Anniversaries, Birthdays, etc).